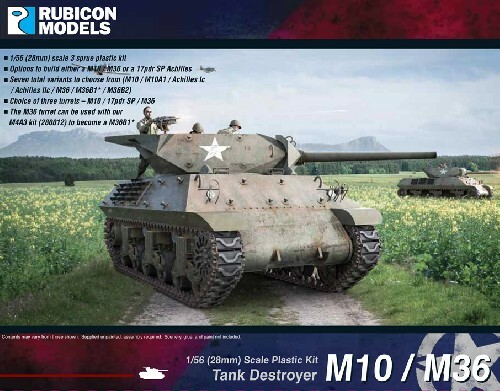 The M10 Tank Destroyer (christened the “Wolverine” by the British) was a WW2 US tank destroyer based on the chassis of the M4 Sherman tank fitted with the 3-inch (76.2 mm) M7 Gun. It was numerically the most important US tank destroyer of WW2 and combined a reasonably potent anti-tank weapon with a turreted platform. Despite the introduction of more-powerful types as replacements, it remained in service until the end of the war. A total of 6,706 were built between 1942 & 1943. The British converted some M10s to use their successful 17-pounder (76 mm) anti-tank gun, which they designated as “17pdr SP Achilles”. The turret needed modification to take the longer gun. The 17-pounder was of a similar bore, but longer and using a larger propellant charge had far superior armour penetration capability. It was used by the British, Canadian, and Polish armies in Italy and northwest Europe. About 1,110 were built. The M36 Tank Destroyer (nickname “Jackson”) was essentially an up-gunned M10 tank destroyer, replacing the former’s 3 inch (76.2mm) M7 Gun with a powerful 90mm gun. The M36 first served in combat in Europe in September 1944, where it proved to be a match for any of the tanks being fielded by the Germans. About 1,400 M36s were produced during the war. The need for 90 mm gunned tank destroyers was so urgent that, during October to December 1944, 187 conversions of standard M4A3 hulls were produced; these vehicles, designated M36B1, were rushed to the European Theatre of Operations and used in combat alongside standard M36s. The M36 also saw use in the Korean War, able to defeat any of the Soviet tanks used in that conflict. Some were supplied to the Koreans as part of the Military Assistance Program and served for years, as did retrofit examples found in Yugoslavia, which operated into the 1990s. Two remained in service with the Republic of China Army at least to 2001.